In recent years this has involved moving more into the imaging of the night sky and some of his images can be seen elsewhere on this site and are used in the presentations. 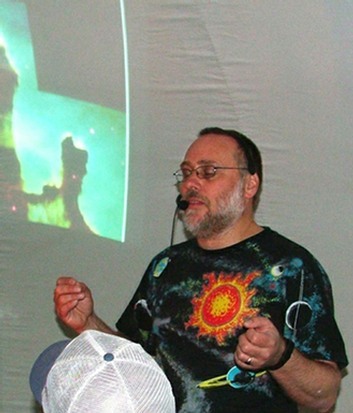 ASTROSPHERE is presented by Steve Ibbotson, an amateur astronomer for nearly 50 years. My initial interest in astronomy was sparked by the Apollo Moon Missions, which since then has developed into his business. I am still an avid sky watcher observing and imaging on any clear evening. If you wish to have this sort of event at your location please realise I do need help and time to organise this. I do believe that everybody should have an opportunity to look through a telescope at the splendours of the night sky and that that night sky should be preserved for the future generations without the continual blight of light pollution, which is not only a waste of money and energy to us all but is effecting a lot of our wildlife too. Over the years I have seen some wonderful sights in the day and night sky including 2 total solar eclipses, many lunar eclipses ,the great comets Hale Bopp and Hyakutake and lots of spectacular meteor showers to name some I have witnessed. Through the years I have collected various telescopes and observational equipment and some of this equipment can be brought along to observational days or nights weather permitting of course.